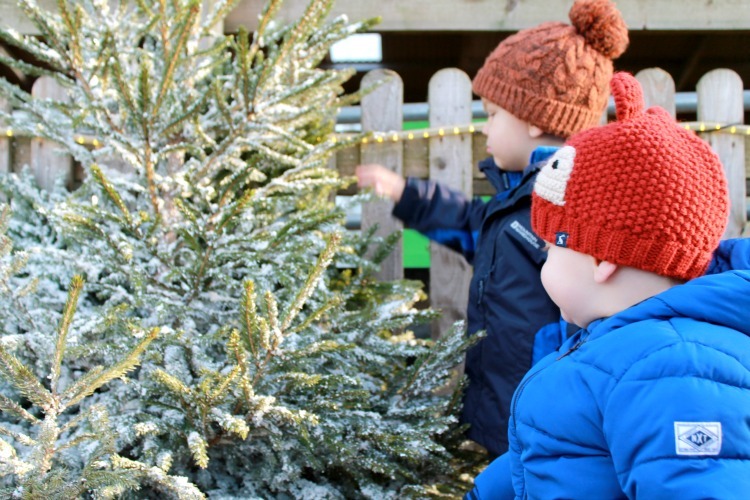 Willows Activity Farm is open daily throughout the year and from now until 24th December 2015 visitors are invited to visit Santa in his Spectacular Grotto, where children will receive a golden key to unlock Santa's Toy Shop and choose any toy from the huge selection to take home. There is also the Elves Teddy Bear Workshop where children get to make and adopt a teddy bear. 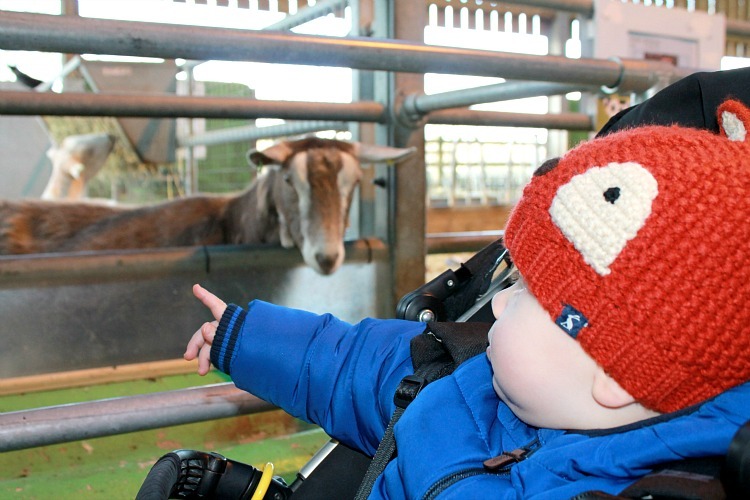 Children can also join in the telling of the Nativity story with live sheep and donkeys, go ice skating on the magical ice rink and take a ride on the tractor into the Festive Wood. 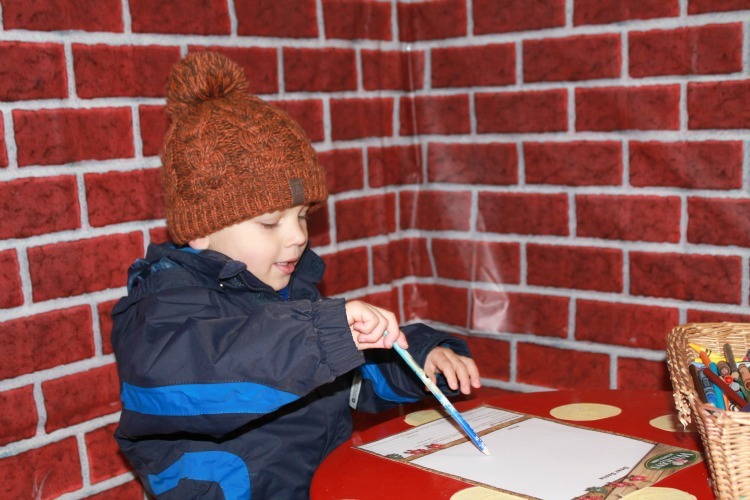 And if you visit the Elves House they can write a letter to Santa and receive a free reply to their home address. Children are given a special Willows Elf Passport to complete through the day; if all stamps are collected they'll get some magic reindeer dust at the end of the visit! Our day out at Willows started with a visit to Santa in his Grotto. We visited on a Sunday which as you can imagine is one of the busiest days to go, so we had quite a wait to see Santa. There are lots of amazing displays set up along the tunnels into the Grotto, with a candy lane penguins, woodland creatures and polar bears to keep children amused. Santa's Grotto was amazing! It was a spacious room that looked like a little wooden cabin, with a Christmas tree, a fireplace, presents and of course an elf. Little N was a bit apprehensive about going in and didn't want to speak to Santa at first. 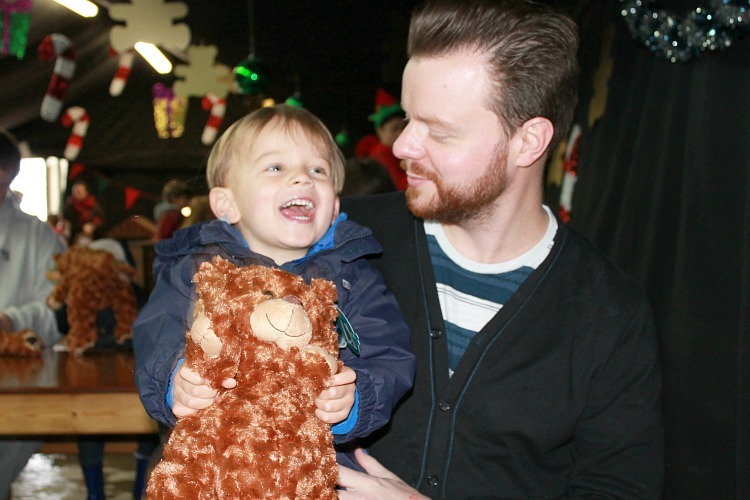 He clung on to Ian and wouldn't even look at him, but Santa took it totally in his stride. He asked gentle questions to help Little N to relax and feel at ease, and in the end even got a smile and a high five from him! 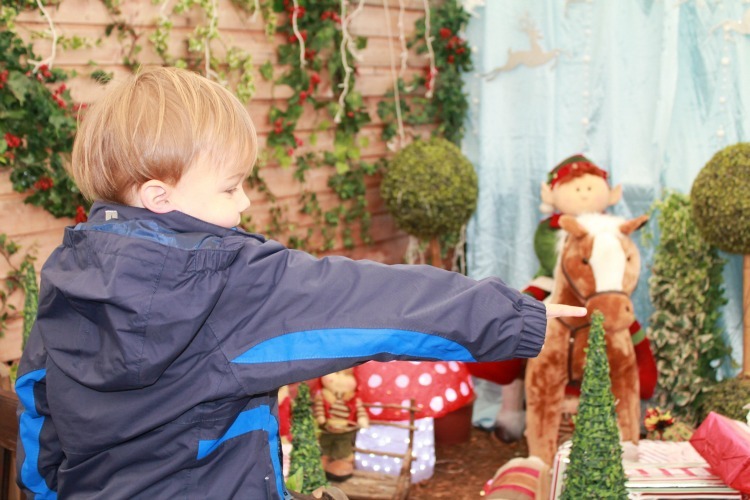 Cameras aren't allowed in Santa's Grotto, but the elf will take a photo which you can get at the end of the visit. Santa gave the boys a golden key each to be able to unlock his Work Shop and choose a toy. Picking a toy took forever as there were so many brilliant options! Puzzles, cars, play-doh, dolls, crafts, colouring sets - whatever your child is into there is bound to be something for them. The boys wandered around with wide eyes and pulled lots of different toys off the shelves. Eventually they settled on a big wooden tractor for Baby J and a set of cars for Little N.
After a quick stop for some cake and juice we headed to the Elves Teddy Bear Workshop. They boys were given a teddy bear each, some stuffing and chose a coloured heart for their bear. Little N chose red for his and blue for J's. They were too make a wish and put the heart inside the bear, then fill it with stuffing before taking it back to the Elf to get their adoption certificate. 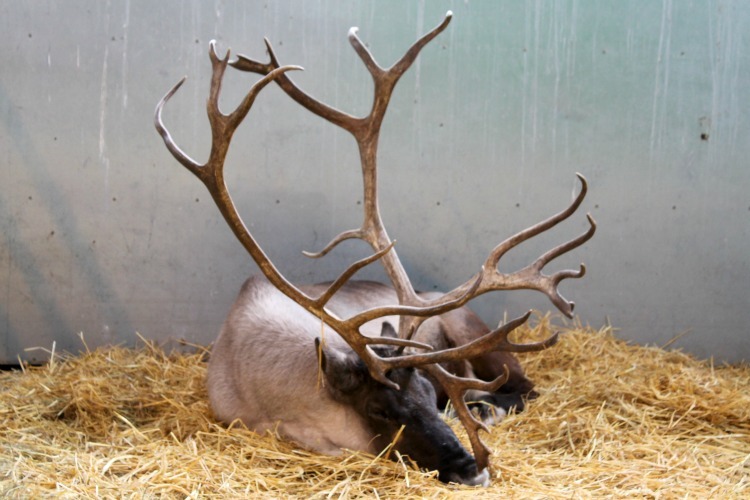 We then took the boys into see some of the animals including the reindeer with their stunning antlers! I think Ian enjoyed seeing the animals more than the boys did; he is quite a softy at heart. Baby J was intrigued by the goats and when we came back the following week I bought some animal feed so that they could have a go at feeding them. Little N thought it was hilarious and told me that the goat's tongue tickled his fingers! As neither of the boys can write yet they decided to draw a picture for Santa instead. And by draw, I mean scribble in Baby J's case! They popped their letters into the special post box in the Elves House and were thrilled to receive letters back a few days later! The Festive Wood ride was a lot of fun and was Little N's favourite part about the visit. Apart from the toys of course! 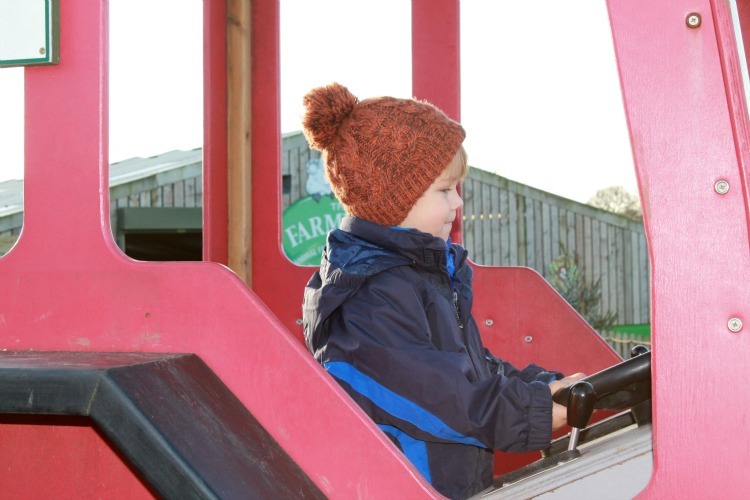 He loves tractor rides and this one goes over bumps and through big puddles, with Christmassy versions of his favourite songs playing all the while. He was delighted when the Hokey Cokey was played! I didn't manage to take a photo during the tractor ride as I had to hold on to J to stop him from trying to escape. We had a fabulous time at Willows Activity Farm Santa Spectacular and we will be making it a Christmas tradition to go every year! 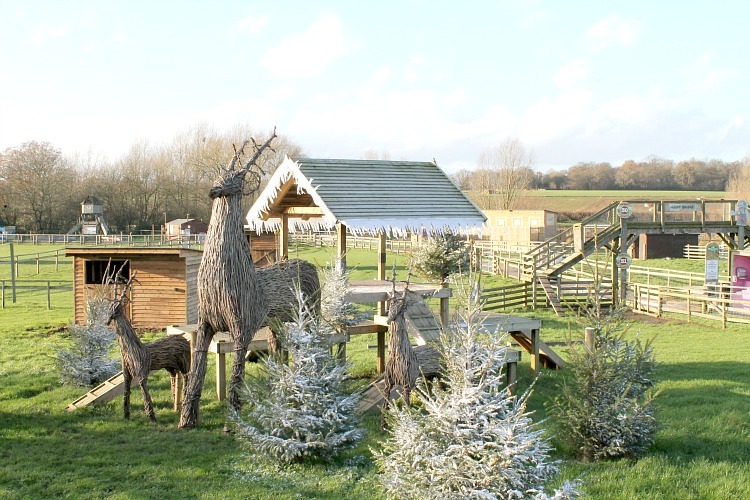 For tickets or more information about the festive family fun at Willows Activity Farm this Christmas, visit www.willowsactivityfarm.com or call 0870 129 9718. 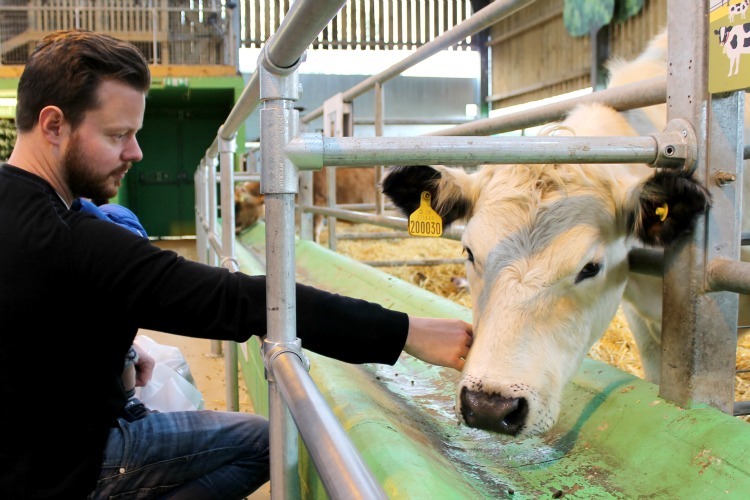 Follow @Willows_Farm on Twitter for all the latest updates. Aw how lovely visiting a grotto is definitely a must! We go to a couple!! The kids love it or shall i say i do ha! :) I love your festive jumpers and how traditional and lovely did that place look! Thanks for sharing! Ohmygoodness!! This is happening for our boys THIS WEEKEND!!!! So excited! It's the first time we are taking them to see Santa. Now they're 2 it seems like the right time; the last couple of Christmasses, I think they would have been frightened by the man in red, but this year they're really getting to grips with the whole 'Christmas' thing. I booked it earlier in the year and I'm SO excited it's almost upon us! This looks fab we wanted to take Blake to our local farm for this kind of thing but it was too pricey for us for the dates we are available on. That looks a lovely place to vist Santa, we go let down by a place to see Santa which was really disapointing but we found a local shopping centre one. Which wasn't great but the kids were happy, we then found a giant snow globe which they went in and a amazing time!